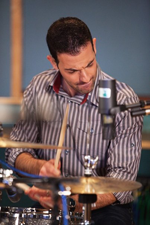 Two-time GRAMMY® nominated, drummer/percussionist Steve Moretti has over 17 years in the music industry. Recognized for his musicianship and versatility in multiple styles, Steve has performed with numerous vocal and instrumental artists from Michael McDonald, Toni Tennille, Michael Brecker, Arturo Sandoval and Lionel Hampton to The Coasters, The Pointer Sisters and Louie Bellson. He toured with Matt Catingub and Rosemary Clooney for six years and recorded two GRAMMY® nominated CDs with them on Concord Records: Sentimental Journey and The Last Concert. Among his contributions on scores of recordings is a children’s CD he played and co-produced: Jazz Baby (Origin Records). Frequently engaged for symphonic drum set performances, he recently appeared with the Alabama, Atlanta, Cincinnati, Milwaukee and Nashville symphony orchestras. Steve also drums for Atlanta’s well-known rock band The Swear and tours with popular Chicago-based cabaret entertainers Amy Armstrong and Freddy Allen. He is endorsed by Pearl Drums, Paiste Cymbals, Aquarian Drum Heads, Audix Microphones and Vic Firth Sticks.